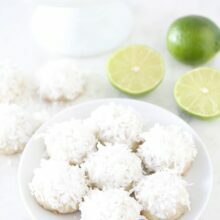 Lime Coconut Snowballs-buttery cookies with a hint of lime, a sweet lime glaze, and a sprinkle of coconut. These are cookies are a family favorite! 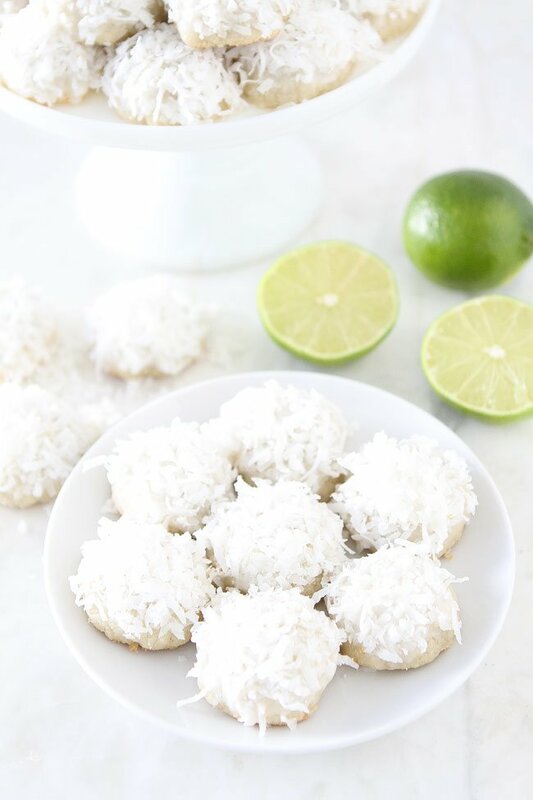 Today, I am sharing one of our very favorite cookie recipes, Lime Coconut Snowballs. When Josh and I got married, we made hundreds of these little snowball cookies for our wedding. They were a hit at our reception and are still one of our favorite cookies, especially during the holiday season. 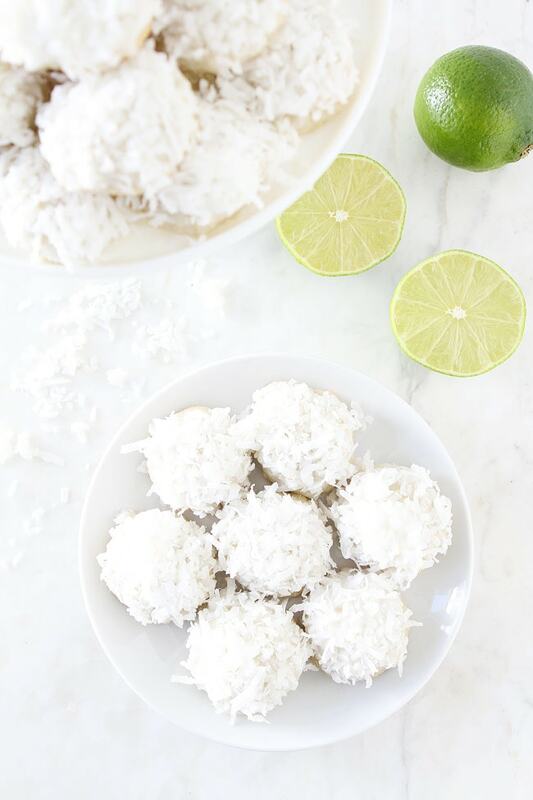 Everyone loves a pretty snowball cookie when it is wintery outside and the lime and coconut combo is perfection! For our wedding, we had a huge dessert table with all of our favorite treats. Josh let me pick most of the desserts since I have the biggest sweet tooth and he didn’t want bridezilla to come out:) Josh did make one request, he wanted Lime Coconut Snowballs. I made these cookies for Josh when we were dating and he instantly fell in love with the cookies and me:) Josh LOVES all things lime so I knew I would win him over with Lime Coconut Snowballs. They were the perfect cookies to serve at our wedding. I love these cookies because they are bite size, which makes them perfect for parties. 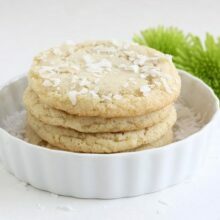 Plus, the coconut snowy tops make the cookies so beautiful! We have been married for over eight years and we are still baking up batches of Lime Coconut Snowballs. They are the cookie that our friends and family expect and look forward to every Christmas. Everyone fell in love with them at our wedding and they still ask for them today! 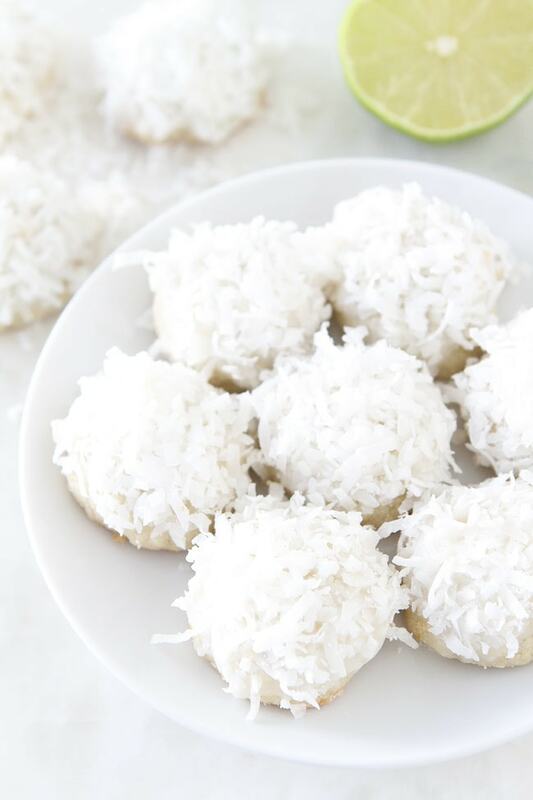 Add Lime Coconut Snowballs to your Christmas cookie list this year. They are our favorite and I think you will like them too! These cookies are a family favorite. We love making them during the holidays or anytime! For the cookies, in bowl of a stand mixer fitted with the beater attachment, mix flour, lime zest, sugar, and salt on low speed until combined, about 5 seconds. With mixer running on low, add butter 1 piece at a time; continue to mix until mixture looks crumbly and slightly wet, about 1 minute longer. Use hands to roll dough into 1-inch balls. Place on parchment-lined baking sheets, spacing about 1 1/2 inches apart. Bake one batch at a time in 375-degree oven until lightly browned, about 12 minutes. Cool to room temperature. For the glaze, whisk cream cheese and 2 tablespoons lime juice in medium bowl until combined and no lumps remain. 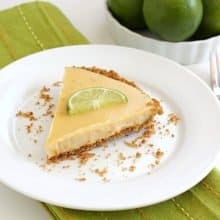 Whisk in confectioners' sugar until smooth, adding remaining lime juice as needed until glaze is thin enough to spread easily. Dip tops of cookies into glaze and scrape away excess, then dip into coconut. Set cookies on parchment-lined baking sheet; let stand until glaze dries and sets. Store in an airtight container for up to four days. Note-to make the superfine sugar, pulse 3/4 cup of sugar in a food processor for about 30 seconds. These sound delicious! Your goodie bags look fabulous! I bet everyone at your party was just thrilled! Great pic of you two- happy anniversary! I love lime cookies. These look wonderful! I’ll look forward to the cranberry white chocolate cookie recipe. Happy 6 month anniversary you two love birds, I hope the honeymoon lasts a lifetime! I start my marathon tomorrow, wish me luck…I’m gonna need it! The cookies look great! What a sweet couple you are. He sounds like a KEEPER! 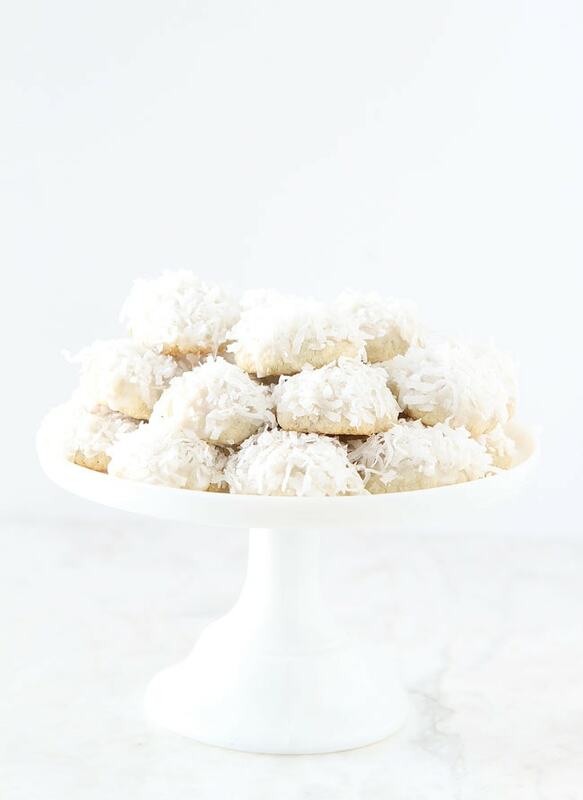 Those cookies are calling my name… I love lime coconut so you can imagine how much I am drooling right now. Great post! You two make a great looking couple and he’s lucky to have a gal that loves baking up a storm! whew! I’m tired just reading this! But it sounds like you had fun baking. I’ve just started my baking, I don’t know if I can do an all day marathon (I have a really small kitchen). Love the cute photos btw. What a great looking couple!!! I love baking days! They are so much fun! that’s really a marathonic baking day! I bet you had a lot of fun!!!! Wow, you were busy! Your goodie bags are adorable! I did some baking this weekend also and made a couple of the same ones that you baked — the World Peace cookies (the best cookies ever, perhaps?) and some peppermint bark. All of your cookies sound great — love the coconut lime ones that you posted today! And happy 6 months to you and Josh! Cute pictures. I still can’t believe how long your hair is getting. I have NEVER seen it this long. Wish I could have been there to bake with you. Christmas baking is the best! Sounds like you had a fun filled baking weekend! I love the apron and nice photos! Yummy the cookies look so good. You are making me tired with all those goodies baked, but it sounded like loads of fun. Happy 6 months to you and Josh. You guys make one cute couple! Happy six months, cant believe it’s been half a year already! Love you guys!!! You guys are the cutest! The cookies look amazing yummy! It looks like you were one busy lady this weekend! Can’t wait to see the rest of the recipes! Congrats on your 6-months! Ya’ll seem so happy- it is great! I love that I am not the only one doing these crazy baking marathons. All your cookies and treats sound wonderful! I am sure the lucky recipients were very happy! Wow! you were sure busy! The goodie bags look fantastic! You lucky girl! 3 bouquets! WOW! Congratulations on your 6 month anniversary!!! nice photo of you guys 🙂 and those cookies sound delish! These look delicious and that is so sweet that your husband bought you flowers. How sweet! Congratulations on your 6 month anniversary, Maria, may you have many more. I love your goody bags, they look delightful, as do your snowball cookies. You certainly have been baking up a storm. Great job! Thanks also for stopping by my blog, I appreciate your kind comments. Don’t you look adorable in that cute apron. And that was indeed a fun sweet weekend. Maria, your cookie bags are beautiful. Happy Anniversary! Oh wow – you did a bunch of baking – it all looks great! Congratulations on your 6 month anniversary!! I have just finished doing exactly the same as you, and boy am I tired. I will post about my Christmas boxes shortly. If you are having trouble emailing me, could you please post a comment with your email address in it (I won’t publish it), and I will email you direct from another address so that we can tee up. The flowers are lovely! And I really think it’s great that he likes to help in the kitchen, too. The apron is adorable. I would kill for an all day bake marathon! Someday… For now, I bake in fits and starts, but it’s getting done. That sounds like fun. I love just spending a whole day baking. All of your cookies sound wonderful! I have a lime-coconut truffle recipe that I love, so I’m very excited to try the combo in cookie form. Happy 6 months to you and the hubby! Cookies sound so good, wish I was on your cookie list! Love the apron 🙂 Sounds like a delicious baking marathon! Aw, you guys are too cute! And even cuter with the snowman apron 🙂 You are a lean, mean baking machine! Nice work! Six months anniversary?! That’s so cute. You must be in love! Aww, what a cute picture! We are about to hit our 3 month – it really flies by doesn’t it?! You guys are way too cute! Happy Anniversary! I’m worn out just reading everything you baked. the goodie bags look fabulous. Happy anniversary! Wow! That is an impressive day! I used to do stuff like that, but I never made quite so many cookies in one shot. Very funny that you worked out first. I do that too. It’s the belief that you can somehow burn off all the stuff you lick out of the bowls! Maria your baking marathon was well worth it, everything looks so festive and delish. Holy cow woman-everything looks so insanely good! I’ve been scrolling down and peeking at everything. You’ve been busy. I wish my gnocchi looked as good as yours do, not to mention your treat bags. Wow I hope you post the peppermint ice cream recipe. My boyfriend gave me a nice ice cream maker for my birthday in AUGUST!! I still haven’t used it but I promised him some holiday themed flavors! Yummy cookies! I love all the pics. You guys are so cute! You guys are too cute and Happy 1/2year anniversary. It is apparent how happy you are together!!!!!!! Those cookies look good. 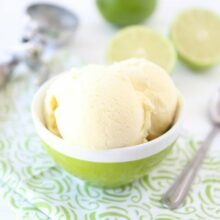 I love lime! Congrats. You two are too cute! those coconut and lime cookies look scrumptious! These look double yummy too!!! I love cookies like this! This is a great twist on the classic snowball. These are so cute!! 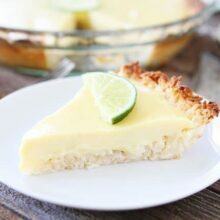 I love the coconutty topping! Love the coconut on these! These are the cutest little cookies! These sound so yummy Maria! You’ve got me day dreaming now, I want one with a cup of hot chocolate.! And make me picture snow falling lightly over this HOLIDAY TREE-SHAPED CHEESE BALL – check out the recipe. What a cute and fun cookie recipe for the winter! Happy Anniversary! I love anything coconut! I make something similar but I use almond flour instead since I have an intolerance to gluten. They do vary in texture since they don’t contain gluten, but I actually prefer the nutty flavour! Love that you added the lime in these holiday cookies! These look great! Something different than the usual Christmas cookie, but still yummy and festive! These little sweet yummy balls look freaking delicious and they are very healthy I suppose! I’m gonna try this one! Once again you do not disappoint! These are delicious! I do not have a mixer but was able to do it all by hand pretty easily. Thank you Maria! Has anyone tried the recipe? The Doug is very dry and difficult to work. We make these cookies all of the time. You might have to squeeze the dough together with your hands when you are rolling the balls, but it shouldn’t be dry. Was your butter and cream cheese the right temperature? These scrumptious delights are by far my most favorite cookie of ALL!!!!!! Everyone moans and groans in yumminess at first bite. I mean to tell you what….Bravo!!!!!! Can I use almond flour instead of all purpose flour for this recipe? I haven’t tried almond flour.